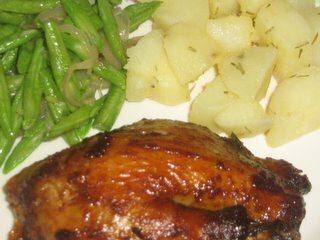 The family had baked chicken, fried beans and rosemary potatoes for lunch yesterday. The meal looked rather simple but it was quite hearty for me. So yesterday for tea I baked muffins. This was my first attempt at baking muffins. 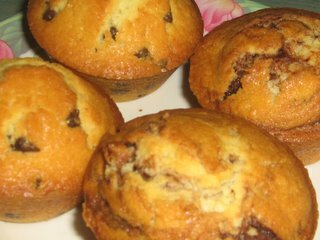 I studied some muffin recipes and mix and match the ingredients to make Choc Chips Muffins. This recipe yields 6 muffins. A Mix flour and sugar in one bowl. B Mix melted butter, milk and egg in another bowl. Incorporate B into A and using a metal spoon, fold in the flour and choc chips. Spoon mixture into the muffin tin and then bake for about 30 mins. Note: I actually divide the mixture into half. Mix one half with choc chips and other half with hazelnut spread. I enjoyed the latter much more.